I would never call a chocolate chip cookie boring to its face…but I might talk about it behind its back. Have you ever craved something sweet and decadent but your brain and your mouth weren’t on the same page? Let me explain my predicament. Yesterday my mouth really wanted to taste a chocolate chip cookie warm from the oven, but my mind was saying “how effin’ boring!” I personally don’t like confrontation, but when it involves my mind vs my mouth I step in to broker the peace. As much as I really wanted to taste a chocolate chip cookie, I couldn’t muster the excitement to make a “plain ole chocolate chip cookie,” so I decided to browse the pantry for inspiration. 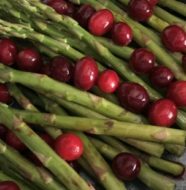 That’s when I came across an unopened package of dried tart cherries, which I picked up over the holidays thinking I might make a cherry-banana bread or something equally festive. Next to the dried cherries was my Sam’s Club-sized Quaker Oats Old-Fashioned Oats. And for a moment, I thought maybe I’ll make a cherry crisp or cherry cobbler. But that wasn’t my mission; I still wanted that chocolate chip cookie. So I thought why not combine them all into a chocolate chip cookie with oats (nice for added chewiness and fiber) AND the dried tart cherries (a nice counterpoint to the semisweet chocolate chips). My mouth was calling my brain “genius” and my mind was congratulating my mouth on having such good taste. Finally my stomach had to break up this mutual admiration society to get the recipe in motion. 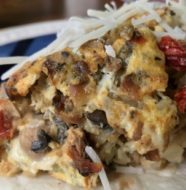 Because the inspiration for this recipe was to break out of the ordinary and try new ingredient combinations, I exchanged the butter I would normally use for some extra virgin olive oil. 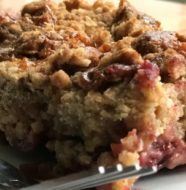 And I added a heaping tablespoon of ground cinnamon to play off the tart cherries to create a subtle cherry crisp flavor note. This is a one-bowl recipe that is easy to mix by hand. 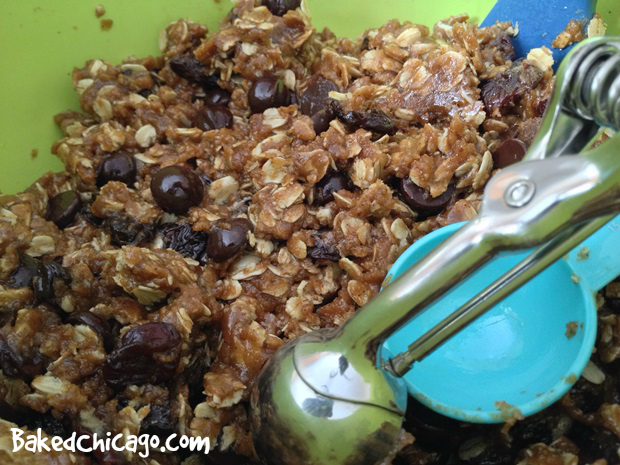 Simply put all the dry ingredients (except the chocolate chips and dried cherries) in a very large mixing bowl. Whisk together to combine. Then add the wet ingredients. Stir to combine thoroughly, then fold in the chocolate chips and dried cherries. If you don’t have a cookie scoop, you could take about 1 tablespoon of dough and roll it into a ball. I tested both techniques in the first batch and found that the cookies were more uniform and held together better on the baking sheet when I used the cookie scoop. Another trick for less mess: In addition to lining my baking sheets with parchment paper, I put parchment paper underneath the wire racks. That way any crumbs from the cooling process fall onto the parchment paper. I also used a food styling trick that I learned watching some Food Network show: reserve some chocolate chips before folding them into the batter. Then put a few chips on top of each dough ball. That way each cookie will have chips on top, making it more visually appealing. 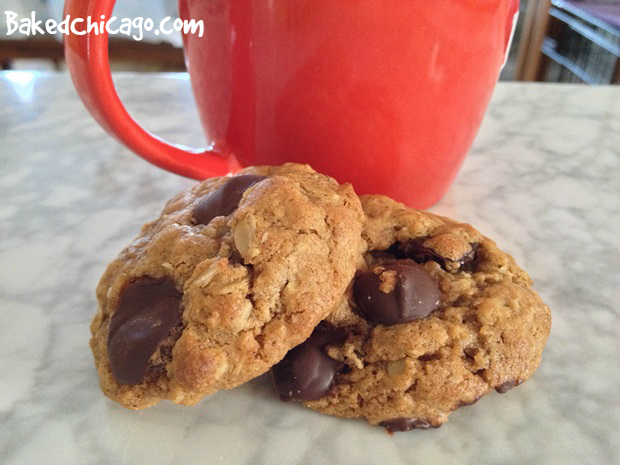 These cookies may look small, but they are dense and chewy. And nearly overflowing with chocolate chips. I rarely recommend “less chocolate” but in this recipe you could easily use half as many chocolate chips as called for in the recipe and you might not notice a difference in the taste. 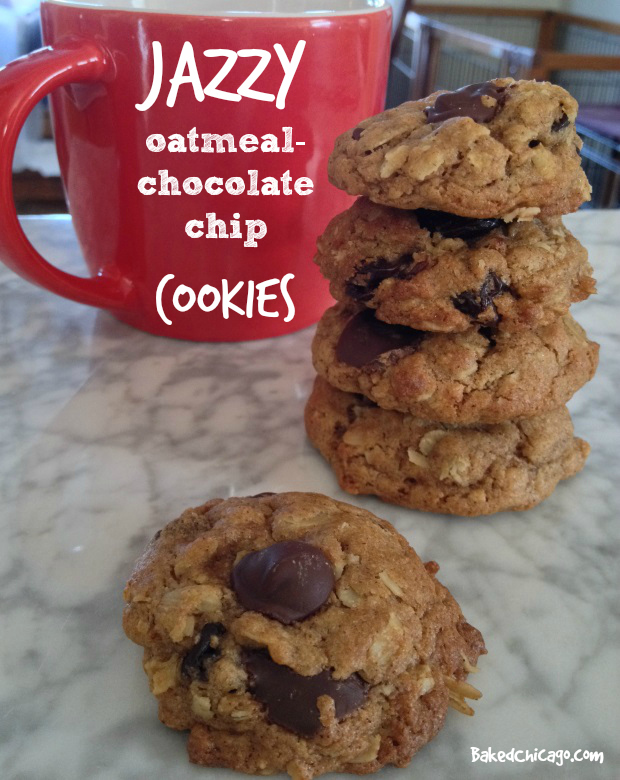 I decided to call this recipe Jazzy Oatmeal-Chocolate Chip Cookies because with the addition of the dried tart cherries, rolled oats and ground cinnamon, this cookie is anything but boring. 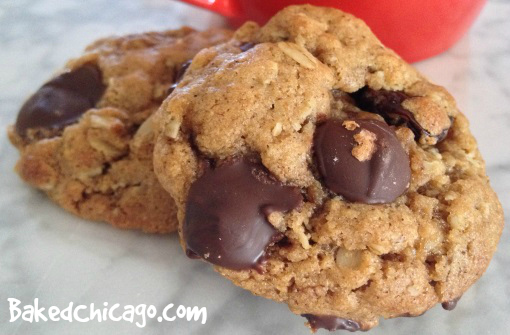 What ingredients would you add to a basic chocolate chip cookie recipe to take it from drab to fab? Preheat your oven to 350 F degrees. Line a baking sheet with parchment paper. Set aside. In a very large mixing bowl, combine the oats, flour, brown sugar, baking powder, salt, olive oil, eggs and vanilla. Mix until combined and the dough is moist. The dough will be dense and crumbly. Fold in the cherries and chocolate chips. Using a cookie scoop, place dough balls (roughly equivalent to 1 tablespoon of dough) on the prepared baking sheets about 1 inch apart. Bake for 10 to 12 minutes, or until golden. Let cool for a few minutes on the baking sheet before transferring cookies to a wire rack to cool completely.